After all the rain, my favorite Clemantis is in full bloom. I wish I could share the name with you but it has slipped my mind. My son moved his stuff home from college this weekend and my mind has been on overload ever since. The house looks like a bomb went off and the washing machine has been running so much that when it's not on, I notice. It's so good to see him that I don't care about any of it. I spent Sunday afternoon working on a project that I will share with you later in the week. Here is a little sneak preview. It's a special project for a special person but I can't give it away quite yet. These arrived a couple of days ago. Oh so pretty and creative. I don't know why I do this to myself because I just can't start any new projects right now but I'll have them when I get some time (get some time...). This very beautiful pile of fabric sits beckoning me, but I won't be tempted. It will be worth the wait. Hope you had a good weekend! I have wondered if I can grow clematis where I live. I am afraid it might be too hot. the clematis is just beautiful! Beuatiful !!!! the clematis...................happy day........enjoy !!! I'm looking forward to seeing what you are sewing! Oh those books! I want to stop everything else I am doing and make quilts like that, *sigh* no time. My daughter is home from school and the same bomb went off here. lol, no matter. I love that she's home! I am so excited because after a torrential rain, my impatiens are virtually bursting out of their pots, love it! Your new project looks gorgeous! Loved running into the other day! Hope P enjoyed his dinner :) That clematis just might be one of the prettiest ones I've seen. You know that bomb that went off at your house well I think it some of the aftermath landed over here only in the form of GIRL STUFF!!! Hope you are having a great day! ps. love the books and fabrics!!! Where do find such lovely goodies? I do not know what variety of clematis you have, but it is gorgeous. 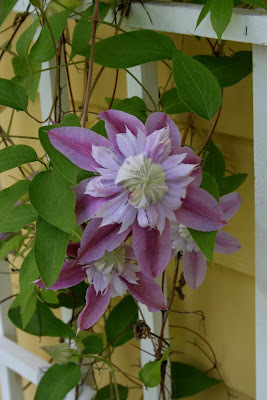 My purple clematis has also bloomed...I love them. Beautiful flower-and I love the fabric...can't wait to see the mystery project! That Clematis is so beautiful and perfect that it doesn't even look real! Did you get the hot glue gun out again? Gorgeous...everything...from the flower to the books to the fabric...I've been wanting to look at those books myself! Wow I just HAVE to learn to sew so I can buy fabric like that and go nuts. :-) I haven't seen you in a while, Renee, I hope you are great! !